I was surprised with the mismatch of data for pax. numbers. See above : MAA spokesman said target for 2019 will be 350.000 pax . and Corendon is aiming on 200.000 travellers bookings, meaning 400.000 pax for MAA. outbound and inbound combined. If pax. volume from thirds parties are added. ( Ryanair and pilgrim flights ) for 2019 , 500.000 pax. must be possible. 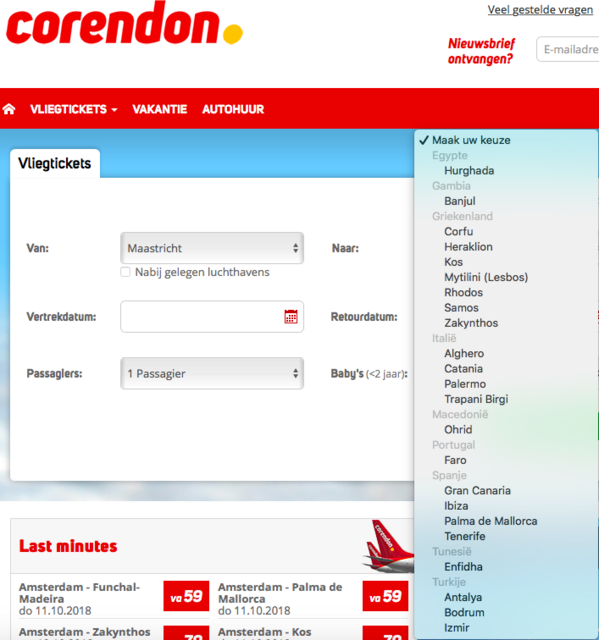 At this moment the Corendon website is not showing flights from MAA to Canary Islands and not bookable yet, but mentioned in interview. Hopefully the missing info. will be added soon otherwise Corendon will miss the early bookings and travellers. As Always , please feel free to add your info. Thanks for your support , vliegtickets section shows also S18 schedule . Ibiza bookable for S18 but not for S19 , also Catania bookable for S18 but info for S19 not found . Canary Islands yes but Lanzarote and Tenerife ?? Status AGP/Malaga ? not confirmed or just a rumour ? I kindly refer you to the Corendon and Ryanair news threads. Myself and some fellow forum members have been doing their best to keep those up to date and I check regularly for changes. - Corendon destinations from S18 currently not bookable in S19 are Enfidha, Catania, Ibiza and Trapani. List of destinations bookable can be found in the thread. Concerning new destinations such as Malaga, there's nothing yet visible in the reservation systems so they are just a rumor at this point. There's still a lot of changes to be expected; in almost all cases Corendon hasn't even loaded flight times yet, just days of operation. It's likely that we'll probably know sometime in November whether a third plane is gonna be based in MST. This has to do with the slot allocation procedure at Schiphol which will be decided in November. - Ryanair : All destinations served in S18 are bookable for S19. Same times, same frequencies. In addition, Ryanair will indeed operate to Malta, twice a week. MAA is still looking for more people , approx 50 ( ! ) for further expansion of their business. Op het luchtvrachtcongres dd. 29/11 a.s. zal een van de sprekers aldaar zijn dhr. Jos Roeven, managing director van Maastricht Aachen Airport, waarbij de nadruk zal liggen op het behoud van luchtvracht voor Nederland en MAA als snelgroeiend alternatief voor het volle Schiphol. Hoewel de spreektijd relatief kort is , blijft het een prima gelegenheid om op de bijbehorende netwerkborrel met de juiste relaties contact te leggen en de mogelijkheden van MAA onder de aandacht te brengen.